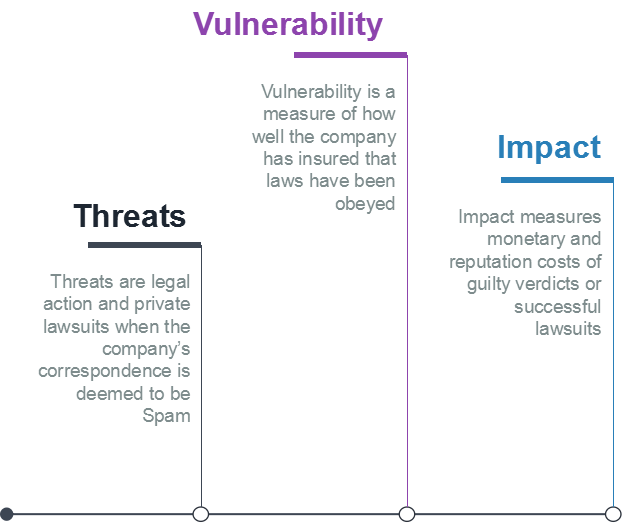 Business-to-Business Marketers face a challenge in complying with a myriad of anti-spam legislation around the globe. They also need to take urgent action because the risks of violating Canadian Anti-Spam Legislation (CASL) will grow much larger on July 1. Many courses of action can be taken with respect to current and future customers and prospects. Marketers can use Risk Management theory to assess each alternative and choose the one that fits the companies goals, strategy, and available resources. In addition there are financial, time, and lost opportunities costs for complying with anti-spam legislation. So risk assessments must balance costs of two types. Request explicit permission to be added to an emailing database from each current and future customer or prospect residing anywhere in the world. Many B2C marketers take this approach. The downside is drastic reduction in the emailable list. The upsides are ease of implementation and assurance of legal compliance. Obtain explicit consent to send commercial correspondence. This approach costs extra effort. Cease sending correspondence to these Canadian contacts/prospectst. This approach costs opportunities for engagement with current customers and sales to prospects. Effort is required to determine country of residence. There are additional complications related to implicit consent; these are outlined in the webinar and in reference 1 below. Canada is a unique threat because of high probability of lawsuits. Other countries fall into three categories that will be explored in Part 2 of this blog post. RightWave can assist maketers in managing their database reach in Canada. For more information, contact RightWave. In Part 2 of this post, other international legislation will be explored. Material presented in this blog post should not be considered legal advice. Individual cases and circumstances vary. We recommend that marketers consult their legal advisors to ensure compliance in their specific cases.